and two blocks for the bushfire quilt project. i'm going to be making a wonky star quilt soon. i love these stars. Lovely! I like the linen. The spider blocks are great. I am so tempted to make a quilt like that. I love the wonky stars too. Very nice! Love as you match the colors. I want to make a spider web quilt so much. did you use paper or cloth underneath? Love both blocks and love the little foot in the pic. lovely blocks! 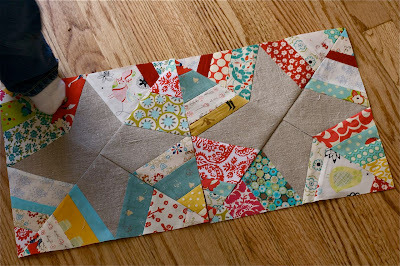 seeing those star blocks makes me think that you must have the best fabric scraps. ever. 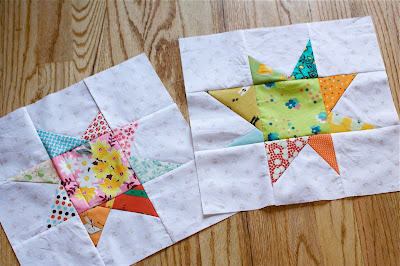 I made 2 wonky star blocks for the bushfire quilt project too. And those stars could prove to be seriously addicting. Like you, I'm going to be making a wonky star quilt soon. nice of you to make them! 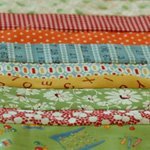 Your quilting is absolutely lovely- keep up the good work! I LOVE the spiderweb blocks, good choice of color for the centers! it is all so great! i love the spiderweb quilt. i am going to give it a try...a bit nervous, but i can't help myself. Oh those are so cute. I've never seen those blocks before! Quiltville huh? Thanks for the inspiration! I loved making these too! They're on the list. I love the linen in your spider blocks.